Kansas City’s Most Historic Hotel Reveals Its Newly Transformed Look, with Eclectic Food and Beverage Options, Modern Guest Rooms, Elegant 1930’s Design, and Unique Performing Arts Program. “When we purchased the hotel, we knew right away that it was something special and we didn’t want to disrupt its natural 1930’s elegance and charm; however, it needed to be updated with today’s modern amenities,” said Sheenal Patel, CEO of NVN Hotels. The historic Hotel Phillips Kansas City, now Curio Collection by Hilton, owned by Arbor Lodging Partners and managed by NVN Hotels, officially reopened its doors to Kansas City visitors and residents, after undergoing a $20 million renovation that transformed nearly every aspect of the hotel. The iconic, 20-story hotel with an eminent past, features 216 exquisite guest rooms and suites that combine modern day comfort and amenities, with 1930’s elegance and design. In addition to luxurious accommodations, the hotel boasts exciting food and beverage destinations, elegant meeting and event spaces, and a unique arts and culture program unlike Kansas City visitors and residences have ever seen. 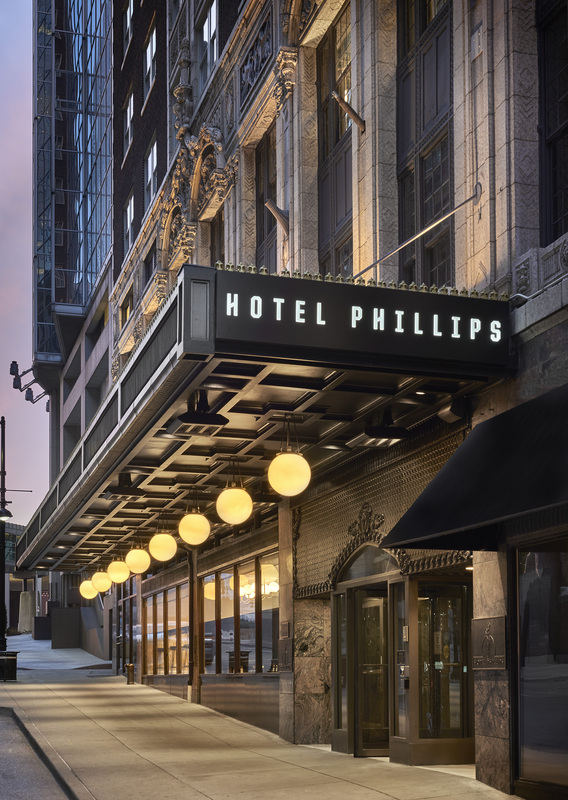 Listed on the National Registry of Historic Places, Hotel Phillips is an art deco gem that in January 2017 joined Curio Collection by Hilton – a global portfolio of distinctive, upscale hotels across the globe. Hotel Phillips’ $20 million renovation kicked-off in October 2016, and in just four short months, the hotel transformed into a Kansas City destination once more – featuring three new food and beverage concepts, reconfiguration of the iconic lobby, updated technology, and replacement of every guest room and suite. Photos of the brilliant transformation can be viewed here. Tavernonna Italian Kitchen: Hotel Phillips, in partnerships with Chicago-based DMK Restaurants, developed an innovative and approachable Italian restaurant concept, Tavernonna Italian Kitchen. Celebrating the rich, varied history of Italian food, wine and cocktails, Tavernonna uses fresh, simple ingredients to create both traditional and contemporary dishes that entice the senses. Tavernonna Chef, Bryant Wigger – an 18-year culinary veteran, formally of the Four Seasons Beverly Hills and Trattoria Neapolis in Pasadena California – in collaboration with five-time James Beard-nominated Chef, Michael Kornick of DMK Restaurants, sourced ingredients from local farms and vendors to be celebrated throughout the menu, giving the restaurant a clear sense of its locality while honoring the distinctive ingredients rooted in Italy. Behind every Tavernonna dish is ambition, passion, heritage, creativity, style and inspirational local culture and knowledge to cater to Kansas City and visiting diners. 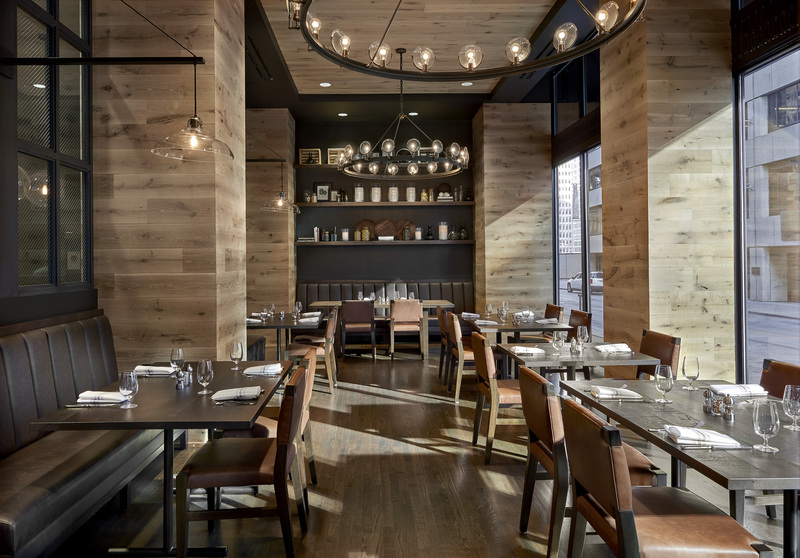 Restaurant and hotel guests can enjoy playful dishes such as, Crudo (Raw Bar), unique small plates, and variety of local steaks, house made pastas, and pizzas. Detailed food and drink menus, as well as hours of operation of Tavernonna are available on http://www.tavernonna.com. P.S. Speakeasy: Discreetly concealed in a long forgotten basement mail sorting room, the underground speakeasy offers a bountiful menu featuring a mix of classic and innovative house-made cocktails. Unlike any other cocktail parlor in the city, P.S. maintains a low profile by not physically being seen from the outside, and relies on word-of-mouth knowledge through past patrons, hotel staff and social media. The cocktail parlor is so committed to upholding its old-world prohibition atmosphere, that it can only be accessed through an unmarked, hidden door. Not so secretive is that behind every P.S. cocktail are carefully selected, mindful, unique ingredients like aromatic bitters, Thai basil, orgeat, and Strega, to provoke guests’ taste buds. Parlor and hotel guests can enjoy thoughtful drinks and light fare such as the Port Fonda, mixing 6 grapes Ruby Port, J.Rieger Vodka, Luxardo Amaretto, Orange Cream Citrate. P.S. is open daily from 5:30pm till 12:00am Monday through Thursday and from 5:30pm till 1:00am on Fridays and Saturdays. Kilo Charlie: Located on the corner of 12th and Baltimore in the heart of downtown Kansas City is one of the city’s most unique, artisanal coffee bars, Kilo Charlie. Derived from the NATO phonetic alphabet radio call signals “K” and “C,” Kilo Charlie serves as a comfortable, unique gathering place for coffee dwellers – accommodating single and group coffee aficionados, as well as on-the-go commuters and hotel guests. Partnering with Philadelphia-based master coffee roasters, La Colombe, Kilo Charlie is anything but a standard “grab-and-go” coffee shop, as La Colombe sources coffee beans from around the world, to provide exotic coffees and top-shelf espresso drinks, suitable for every guest’s taste. Kilo Charlie is open daily, 6:00 a.m. to 7:00 p.m., serving a worldly selection of coffee to hotel guests and Kansas City caffeine seekers. A new, ongoing performing arts program for both guests and local residences, Hotel Phillips’ ArtLight program partners with multiple, local and national visual and performing arts groups throughout the year to bring attention to Kansas City’s vibrant arts and culture offerings. The program features a dedicated Art Concierge, who provides recommendations for local arts and cultural activities, as to highlight the best that Kansas City has to offer, and makes sure that area residents and travelers don’t miss-out on top-notch shows and hands-on experiences. Partners and participants of ArtLight include the Kaufmann Center for the Performing Arts, Kansas City Ballet, Heartland Men’s Chorus, and Broadway Across America/Kansas City Broadway Series. In addition to regularly scheduled events, Hotel Phillips also hosts ‘pop-up’ exhibits and performances, where guests may find themselves singing along with choir members, or getting a sneak-peek of a new ballet. 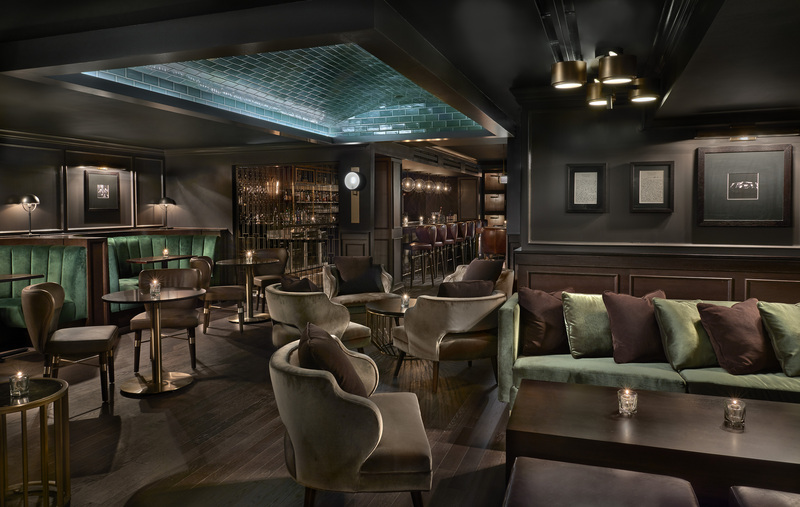 Voted the city’s best boutique hotel by KC Magazine for two years in a row, Hotel Phillips is located in the heart of downtown, and officially reopened its doors to Kansas City visitors and the community, on Thursday, February 23. To learn more about Hotel Phillips renovation, seek additional information, or to make a reservation, please visit, http://www.hotelphillips.com or call (877) 704-5341 or (816) 221-7000. Hotel Phillips Kansas City, Curio Collection by Hilton, owned by Arbor Lodging Partners and managed by NVN Hotels, is Kansas City’s most historic and prestigious boutique hotel located in the heart of downtown. The hotel opened its doors in 1931 and recently completed a $20 million renovation that touched nearly every aspect of the hotel, combing 1930’s elegance and design, with modern comfort and amenities. The iconic, 20-story hotel features 216 luxurious guest rooms and suites, eclectic dining and beverage offerings at its three onsite venues - Tavernonna Italian Kitchen, P.S. Speakeasy cocktail parlor, and Kilo Charlie Coffee Bar - unique visual and performing arts collaborations through its ArtLight program, and distinctive art deco style, featuring an elegant lobby. Hotel Phillips is listed on the National Register of Historic Places and has been recognized in Southern Living, USA Today, Food & Wine and The Wall Street Journal. Visit http://www.hotelphillips.com and follow the Hotel Phillips on Facebook and Twitter. Arbor Lodging Partners is a Chicago-based national owner and operator of hotels. The company was founded in 2005 with the goal of uniting the best practices of enterprising hotel operators and sophisticated institutional investors to effectively underwrite and execute investments in the lodging space. Arbor Lodging Partners makes investments in hotels, acquires loans secured by hotels, and, through its affiliate NVN Hotels, manages operations for its own hotels and those owned by third parties. A leading hotel management company with a range of services, NVN Hotels has been designated one of the nation’s top hotel companies in 2015 by Hotel Management Magazine. To learn more about Arbor Lodging Partners visit http://www.arborlodging.com. To learn more about NVN Hotels, visit http://www.nvnhotels.com. Curio – A Collection by Hilton™ (curio.com), launched in 2014, is a global set of hand-picked upscale hotels that meet independent-minded travelers’ desire for local discovery and authentic experiences, all while providing the quiet reassurance and support of the Hilton name and its award-winning Hilton HHonors program. Discover the collection’s latest stories at news.curio.com, connect with us on Facebook, Instagram and Twitter or inquire about development opportunities at hiltonworldwide.com/development.